Mowachaht/Muchalaht First Nation (MMFN) is in the early stages of working with the Department of Fisheries and Oceans Canada (DFO) on an expanded demonstration fishery in Muchalat Inlet. The fishery will target Gold and Burman River Chinook salmon in late summer, and is expected to be a great income earner for MMFN fishers. Initial discussions concerning the fishery took place at a January 15, Area 25 Roundtable meeting. According to Kadin Snook, MMFN Fisheries Coordinator, “The fishery was first introduced as recreation only,” failing to take into account both the importance of the Gold and Burman rivers for First Nations Food and Ceremonial fishing, as well as the T’aaq-wiihak economic fishing right. 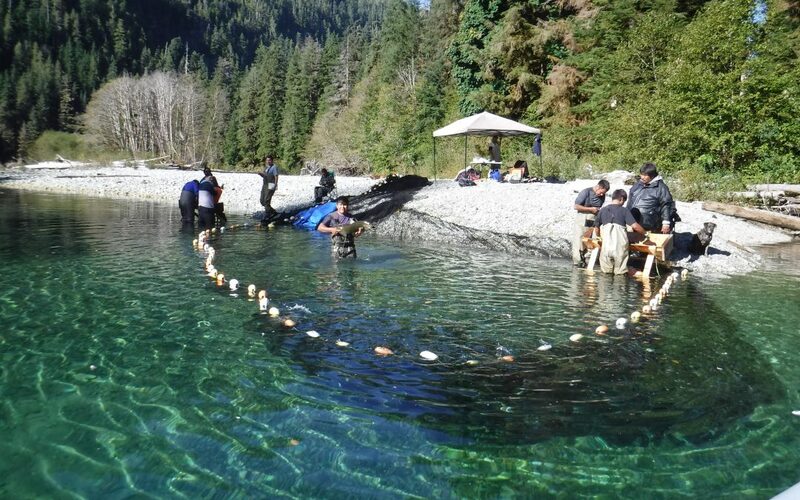 MMFN, in partnership with Nootka Sound Watershed Society and the Conuma Hatchery, have been enhancing Chinook salmon stocks in the river for decades, and Gold and Burman rivers also hold deep cultural significance to local Indigenous peoples. When considering the possibility of a fishery, one of the first steps is a stock assessment. Simply put, a stock assessment is the act of trying to figure out as accurately as possible how many and what species of fish are in a particular body of water, in this case the Burman and Gold rivers. The analysis is used to identify sustainable harvests in the short and long term. Although this process sounds fairly straightforward, it can sometimes be complicated. “We are still trying to find funding for assessing Gold River stocks,” says Candace Picco, T’aaq-wiihak Biologist. One of the challenges, as Picco observed, is that almost 50 per cent of the salmon are Robertson Creek Hatchery strays. Roger Dunlop, Uu-a-thluk’s Northern Region Biologist, confirms that he has proposed escapement goals for Burman and Gold Rivers, and is exploring forecast methods that might work for these systems. An effective stock assessment is critical to being able to move forward with planning and allocation numbers for the fishery. Monitoring the catch is an important part of the assessment, and there is a need for DFO to adequately fund creel surveys of recreational fisheries in Muchalaht Inlet. Proper monitoring will also help fisheries managers target the right fish at the right harvest levels, as Snook explains: “With an opportunity of harvesting at the Gold River because of the two hatchery stocks, we can take advantage of the hatchery production while leaving plenty of spawners for the next generation. The harvesting activities are focused on stocks that include strays from other DFO hatcheries that aren’t genetically native to the Gold River.” MMFN, he added, would like to see the stock assessment funded by the DFO. The Muchalat Inlet fishery has the potential to create significant economic opportunity for T’aaq-wiihak fisheries through harvesting and monitoring, however, the challenge will lie in having DFO work with MMFN Ha’wiih (hereditary Chiefs) to work out the terms of the fishery. The Ha’wiih expect, that as a first priority, conservation objectives will be met, and that First Nations food and economic rights will have priority over other fisheries.